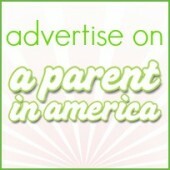 GIVEAWAY: Psychobaby Personalized Gifts, So Cool! 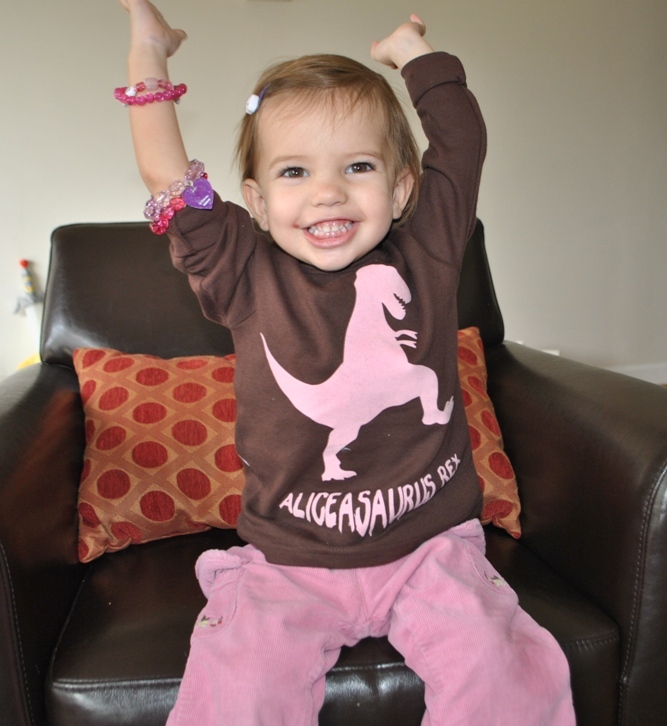 Check out this incredibly adorable tee by Psychobaby on my Alice…it is totally customized to proclaim her Alicesaurus Rex! This is her favorite top, and mine too, because it is so original, just like my girl. Psychobaby’s Custom Shop is full of unique, customizable and personalized kids’ clothing and gifts. 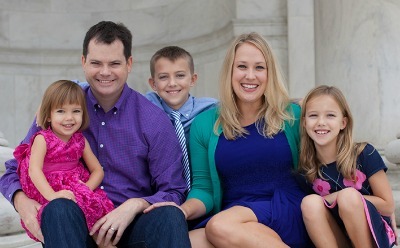 The brainchild of chic urban mamas Marlo Hoffman and Lisa Starbuck, Psychobaby is both a brick-and-mortar shop in Chicago and an online destination for us parentals everywhere. Other cool gifts I love are personalized rocker chic baby blankets $32 (totally unique shower gift), and the personalized rockin’ the beats hoodies ($40) for big kids — it looks like the wearer is listening to an iPod with headphones. Charlie and Eve would so dig these for Christmas. 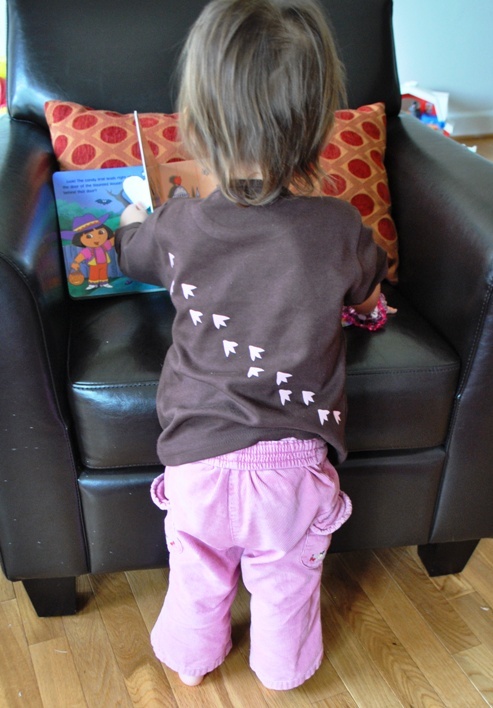 But before you enter the giveaway, you have to check out the BACK of Alice’s tee….yup, them is dino tracks. Would you like to win a Psychobaby Nameasaurus Rex tee or onesie, totally customized with your kid’s name? If you win you will personalize your tee with the name of your choice (up to six letters), choose either brown with pink writing/t-rex or brown with blue writing/t-rex, short-sleeved or long-sleeved, either a baby-sized onesie (6 month – 24 month) or preschooler-sized tee (2 years – 6 years). Leave a comment letting us know who in your crazycool family or circle of friends would love this cute tee, or head to the Pscyhobaby Custom Shop and leave a comment with *your* fav item. The winner will be drawn randomly from all forms of entry in one week on Wednesday December 5, 2012 at 8 p.m. The winner will be notified via e-mail. Only U.S. residents are eligible. Disclosure: Pscyhobaby provided the tee for Alice so I could review the product and facilitate a giveaway. No further compensation was received. My glowing opinion is authentic. First of all, Alice is stunning! As for who would like that adorable t shirt, it would be hard to choose between my hankasaurus and my georgiasaurus! My best friend has an adorable grandson who would be so adorable in this cute tee! My boy, because he always tells us he’s a dinosaur, anyway, just do he can roar. My son would love this T-shirt. What an adorable shirt! My daughter would love it! Love that tee and that Alice is such an awesome accessorizer already! I’d totally get the boy-version of that or the initial spiderweb tee for my almost-3yo! Ooh, my little man would love a shirt like this (but not in pink!). He’s a dinosaur fanatic. I think my Georgeasaurus would love that! This would be perfect for our little peanut (Clara)! Unfortunately, Adelaide is a little long, but I have lots of nieces and nephews who could totally rock it. My nephew would be an awesome Jude-asaurous! Love it! My son spent the whole Thanksgiving weekend playing “T Rex” with his grandma! Benjamin would love this shirt, he was just trying to convince us we should call him Stegosaurus for now on! My daughter would live that shirt! She’s asking Santa for a T-Rex this year. My AlexSaurus would LOVE this! My little 2 year old dude is not happy about getting dressed in the morning, unless there’s something extra fun to wear. Having a cool dinosaur shirt in the mix would make life easier when the helicopter shirt and the firetruck shirt are in the wash.
Gianna would love a shirt that matched Alice’s–she looks so adorable in her picture! These are adorable! And oh so perfect for my perfect little dinosaur girl!! Thank you so much. My Alyssadarling would just love this!!! My 3 year old daughter would ADORE this shirt. We have an amazing Children’s Museum here that we frequent and we absolutely MUST see the dinosaurs at each visit. She also loves to roar and pretend to be T-Rex so this would make it even more fun for her! The one and only Nadiasaurus would be the best dino girl ever in that shirt. My daughter is really into graphic t-shirts like this. And she’s definitely part dino (especially at bedtime). I soooo need one of these for my son Zach … Zachasaurus Rex!! he’s our little destructo man! : ) Thanks for the great giveaways!!! My son loves Dinosaurs!! I know he would love a shirt like that! So adorable!! Thanks for the intro to this! Helen would love the dino tee. How fun! a health hazard. Give a warning, first and maybe even start a new activity. One resents the older family member forcing their opinion on the younger sibling. My daughter will love this T-shirt. It is really cute and best the thing is color pink which my daughter really like.